A HIPEC procedure typically consists of four phases combined into one operation: exploration, resection, HIPEC and reconstruction. The operation starts with a thorough investigation of the abdominal cavity by the surgical team, during which the extent of the peritoneal cancer is precisely determined. 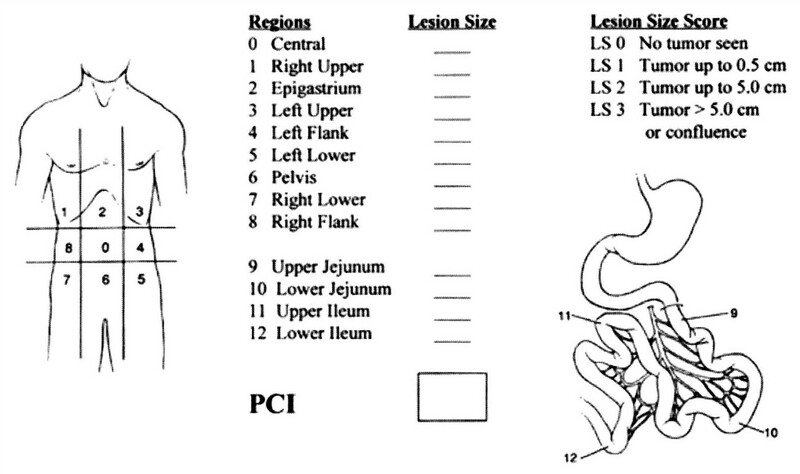 Several scores have been developed to quantify the extent of peritoneal cancer. 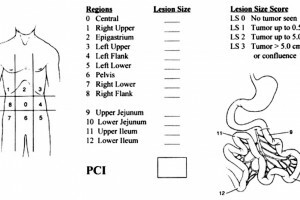 The most commonly used score is the Peritoneal Cancer Index or “PCI”. The PCI is correlated with the prognosis after HIPEC. Higher PCI values are typically associated with a worse prognosis. Most hospitals have defined a maximum PCI for treatment. If the PCI exceeds this upper limit, the operative procedure is terminated and the HIPEC procedure cancelled because the benefit of the procedure in terms of survival does not outweigh the risks. The maximum PCI may be different for various disease types and different among institutes worldwide. After determining the PCI, the surgical team judges whether all visible tumor nodules can be radically removed. The procedure continues only when complete removal of the tumor nodules is determined to be possible. This part of the operation is called “cytoreductive surgery” and is a crucial part of the overall procedure. Cytoreductive surgery involves surgical removal of all peritoneal surfaces and organs that have been invaded by cancer cells. These tissues may, for example, include a part of the small bowel or colon, the spleen, the gallbladder or other abdominal organs. The number of resections that have to be performed varies widely among patients. In general, surgeons try to spare as many organs as possible. After removing all visible cancer nodules, it is inevitable that microscopic cancer cells are left behind. If left untreated, these cancer cells will start dividing again soon after the operation and lead to a recurrence of the peritoneal cancer. To destroy these invisible tumor cells, the abdomen is filled with a high dose of chemotherapy during the operation. Several types of chemotherapy may be used including mitomycin-C, oxaliplatin and cisplatin. This chemotherapy is heated to 41-42 degrees Celsius because it is thought that heat will increase the effectiveness of the chemotherapy. 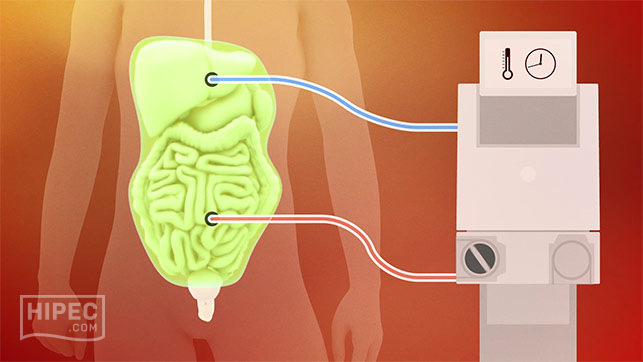 This heating is achieved by a dedicated device capable of heating and circulating the chemotherapy into the abdomen of the patient. Depending on the protocols at various institutes around the world, this step in the procedure lasts for 30 to 90 min. This portion of the procedure is called “Hyperthermic Intraperitoneal Chemotherapy” or in short: HIPEC. Although this step is just part of the entire procedure, the term HIPEC is now commonly used to describe the entire surgical procedure. After the HIPEC procedure, the operation proceeds by restoring continuity of the bowels whenever possible. 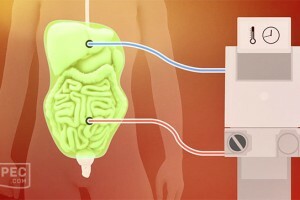 However, a temporary or even permanent colostomy is sometimes required. In most patients, various catheters are inserted, such as catheters in the stomach, urinary bladder or abdominal cavity. These catheters will be removed based on the clinical condition of the patient in the days after the operation. Because the HIPEC procedure is often a lengthy and radical procedure, most patients are admitted to an intensive care unit after surgery for close monitoring of their vital functions.